The Deccan may be roughly described as that portion of Southern India which is bounded the Vindhya Mountains and the river Godavari to the North, and by the Tungabhadra and Krishna rivers to the South: the Ghats or mountain ranges which skirt the seacoast on either side being the Eastern and Western limits. This book takes you on a interesting journey through the history of Deccan right from the times of the Bahamani sultans starting 1300 AD post the Islamic conquests. 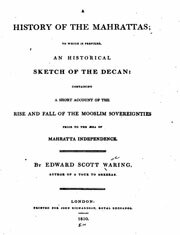 The Mahrattas were once a mighty nation “”, wrote Edward Scott Waring in 1810 ; “” how they rose and how they fell may surely challenge enquiry.””The author was for seven years attached to the English embassy at Poona and had greater opportunities of gaining information upon many points that would not have been available to other people. This book by a Pune based historian talks about what is arguably the most interesting episode in Shivaji’s life. Shivaji the great Maratha king had a life full of inspirational achievements and stories. However his meeting emperor Aurangzeb in Agra and his subsequent escape changed the tide of history for ever. 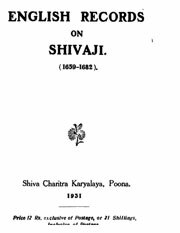 This book uses a lot of authentic sources to describe that story of Shivaji’s life. Ramakrishna Gopal Bhandarkar (6 July 1837 – 24 August 1925) was an Indian scholar, orientalist, and social reformer. Bhandarkar taught at Elphinstone College and Deccan College during his distinguished teaching career. He was involved in research and writing throughout his life. This book traces the history of the Deccan area from earliest times to the Mohammedsan conquests. A little known aspect of Shivaji’s times is the English factories that were present in Surat and Konkan coast. This early British mercantile presence was not threatening to any Indian ruler nor did it matter in the geopolitics of that time. Hence Shivaji had good relations with them and they kept detailed notes on him. This is an invaluable source of information on the great king and a must read for any student of history. The author of the book which Mr. Constable was a great-grandson of Dr. Broughton, chaplain to the first Duke of Marlborough, and author of a sermon on the battle of Blenheim. He was educated at Eton, went out to India as a cadet in 1795. He was at the siege of Seringapatam in 1 799, and for a short time before the restoration of Java to the Dutch commanded in that island. When he wrote the letters which are reprinted in this volume he held the rank of Captain. 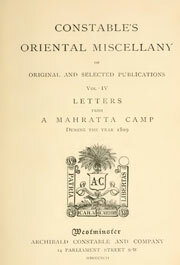 The letters bring to life all aspects of Maratha life in those times. Malhar Rao Holkar (16 March 1693 – 20 May 1766) was a noble of the Maratha Empire, in present-day India. Malhar Rao is particularly known for being the first Maratha Subhedar of Malwa in Central India. He was the first prince from the Holkar family which ruled the state of Indore. He was one of the early officers to help spread the Maratha rule to northern states and was given the state of Indore to rule by the Peshwa’s. Dr. Balkrisbna came of a Kshatriya family of Multan, in the Punjab* Born in 1882, be spent his boyhood in struggles against mediocrity. During the last part of his College career, be came under the influence of some great Indian political leaders, especially of Lala Lajpatrai, Sardar Ajitsingh and the Honorable Gopal Krishna Gokhale. Eventually he became a eminent historian based out of Kolhapur. 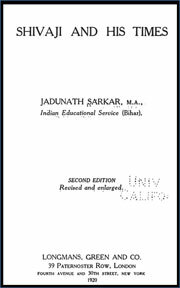 The present volume is the first of a series intended for those students of Maratha history who do not know Marathi. The book is translated from the text edited by Rao Bahadur Kashinath Narayan Sane. 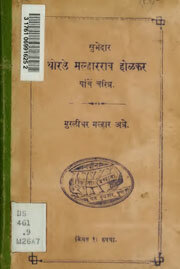 Bakhar is a form of historical narrative written in Marathi prose. 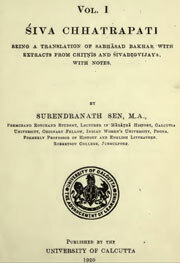 Bakhars are one of the earliest genres of medieval Marathi literature. 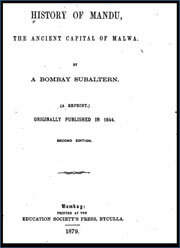 More than 200 bakhars were written in the seventeenth to nineteenth centuries, the most important of them chronicling the deeds of the Maratha ruler Shivaji. 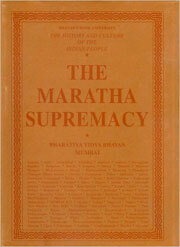 Bakhars are considered valuable resources depicting the Maratha view of history, but also criticized for falsification. 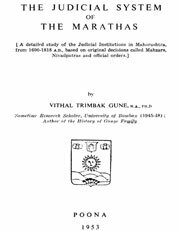 A detailed study of the Judicial Institutions in Maharashtra,from 1600-1818 A.D., based on original decisions called Mahzars,Nivadpatras and official orders. 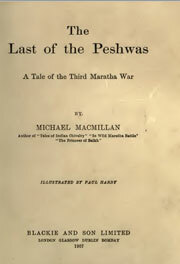 This book is a first hand account of the third and final Anglo Maratha wars. The Third Anglo-Maratha War (1817–1818) was the final and decisive conflict between the British East India Company (EIC) and the Maratha Empire in India. 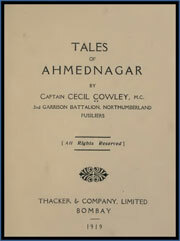 The war left the Company in control of most of India. It began with an invasion of the Maratha territory by British East India Company troops, the largest such British controlled force massed in India. 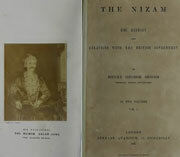 The books is a first hand account of the history of the Nizam of Hyderabad and his relations with the British. Hyderabad was the most powerful Muslim princely state in British India. Thanjavur is one of the oldest cities in India and has a long and varied history dating back to Sangam period. The city rose into prominence during the rule of the Later Cholas when it served as the capital of the Chola empire. After the fall of the Cholas, the city was ruled by the Pandyas, Vijayanagar Empire, the Madurai Nayaks, the Thanjavur Nayaks, the Thanjavur Marathas and the British. 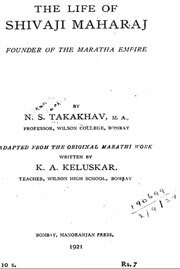 Krishnarao Arjunrao Keluskar a teacher in Wilson college Mumbai wrote a biography of Shivaji in 1907 in Marathi which was translated into English by N S Takakhva. It was a part of the non Brahman movement that claimed that other works on Shivaji were biased based on Mohammedan sources and this was an authentic version. Sir William Wilson Hunter KCSI CIE (15 July 1840 – 6 February 1900) was a Scottish historian, statistician, a compiler and a member of the Indian Civil Service.He is most known for The Imperial Gazetteer of India on which he started working in 1869, and which was eventually published in nine volumes in 1881 and later as a twenty-six volume set after his death. 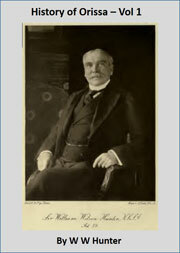 Sir William Wilson Hunter KCSI CIE (15 July 1840 – 6 February 1900). 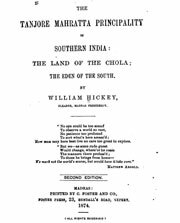 was a Scottish historian, statistician, a compiler and a member of the Indian Civil Service.He is most known for The Imperial Gazetteer of India on which he started working in 1869, and which was eventually published in nine volumes in 1881 and later as a twenty-six volume set after his death. 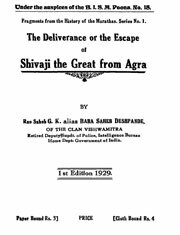 A new and critical study of Shivaji’s life and character has long been due, as the last scholarly work on the subject was composed, by Captain James Grant Duff, a century ago, and a vast mass of original material unknown . to him has become accessible to the student since then . 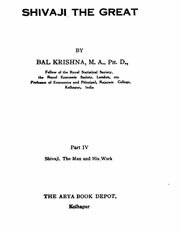 To put the case briefly, the present work differs from his ~eminently readable and still valuable History of the Mahrattas, (3 Vols . 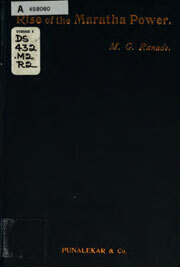 , l826), in the rigid preference of « contemporary records to later compilations , and the exhaustive and minute use of the available sources , ‘ both printed and MS. —in Persian , English, Marathi and Hindi , as well as the Dutch Records in the India office , London. 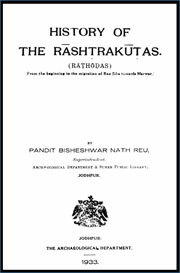 This volume contains the history of the early Rashtrakutas (Rathotfas) and their well-known branch, the Gahatfavalas of Kanauj up to the third-quarter of the 13th century of Vikrama era, that is, up to the migration of Rao Siha towards Marwar. In the absence of any written account of the rulers of this dynasty, the history is based on its copper plates, inscriptions and coins hitherto discovered. Sanskrit, Arabic and English works, which throw some light on the history of this dynasty, however meagre, have also been referred to. 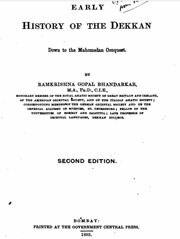 Mahadev Govind Ranade (18 January 1842 – 16 January 1901) was a distinguished Indian scholar, social reformer and author. 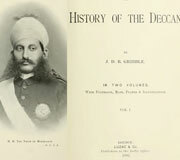 He was a founding member of the Indian National Congress (INC) and owned several designations as member of the Bombay legislative council, member of the finance committee at the centre, and the judge of Bombay High Court..
As well known public figure, his personality as a calm and patient optimist would influence his attitude towards dealings with Britain as well as reform in India. During his life he helped to establish the Vaktruttvottejak Sabha, the Poona Sarvajanik Sabha and the Prarthana Samaj, and would edit a Bombay Anglo-Marathi daily paper, the Induprakash, founded on his ideology of social and religious reform. 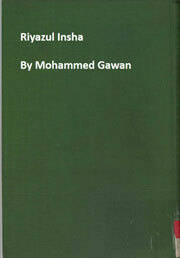 Riyazul Insha is a collection of letters, documents and dispatches of Mohammed Gawan the most celebrated prime minister of Bahamani kingdoms. Mahmud Gawan (1411, Iran – 1481) was a prime minister in the Bahamani Sultanate of Deccan. Khwaja Mahmud Gilani, from the village of Gawan in Persia, was well-versed in Islamic theology, Persian language and mathematics and was a poet and a prose writer of repute. Later, he became a minister in the court of Muhammad Shah-III (1463-1482). A storehouse of wisdom, Mahmud enjoyed the trust and confidence of rulers, locals as well as that of foreign kingdoms, who had great respect for Mahmud. made some sought research, and have found very interesting the life of the Deccan Queen, Chand Bibi, contemporary of Queen Elizabeth, and also the other simple tales narrated here. As no work of this nature has hitherto been published, and the facts are undoubtedly of local interest, I have been induced to place them in book form. A most comprehensive account of Maratha history written by one of India’s most famour historian.